Last week as I was learning Torah in the beit midrash, I felt my 12-year-old and 18-year-old selves peering over my shoulder and each sagely nodding their approval. I'm not sure I can explain what that felt like. Trying to is making me rather teary, and I'm not even sure why.1 It was an eerie and uniquely wonderful sensation. 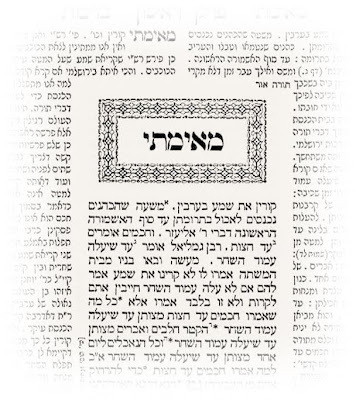 We sat down in the classroom next to the lunchroom-auditorium and opened up a paperback Gemara textbook with a reprint of the first chapter of Tractate Berachot from the Vilna shas and took out our highlighters. דתניא, "as we learn in a b'raisa"
תא שמע, "come and hear"
"'Come and hear,' not 'Come here'!" I remember the teacher joking. I remember, at some point that year or the next, sitting on the ledge in the grassy courtyard of my school, helping a classmate understand a difficult section of Gemara. It suddenly occurred to me that this was really, really fun. It was a kind of game, or logic puzzle, and when I had cracked it, it felt wonderful! I had never really had that sense about anything purely academic before. I pushed myself to excel in school because that's what was expected of me, so that's what I had come to expect of myself. I really enjoyed the few art projects we got to do in elementary school, where I had also enjoyed writing and "publishing" short books, and had liked learning life sciences in seventh grade, but had no particular passion for anything else I studied in school. I was terrified of getting bad grades and I worked very hard to prevent it. I kept the fact that I enjoyed learning Talmud to myself for the next several years. When classes were first tracked, in seventh grade, I started out in the regular, non-honors track for limudei kodesh [Judaic studies]. Over the course of high school, I gradually moved up into the honors class.3 Sometime around tenth grade, my first year in the honors limudei kodesh track, I was first willing to admit to enjoying learning Torah, especially mishna and Gemara. The summer before eleventh grade, I went to an open [to women] beit midrash in my neighborhood and learned the mishnayot of Masechet Kilayim, by myself, with my buddy, Pinchas Kehati. I learned lots and lots of Hebrew words for different kinds of squash. It was thrilling. I don't really remember why, but it was. After that experience, I decided to enroll in what was called "Super Talmud," wherein I spent two extra periods a week studying Gemara, on top of our usual 9-10 weekly periods of Gemara. This meant that I had class until 7:30 pm one night, instead of the usual 5:43 pm high school dismissal time. During eleventh grade, I read As A Driven Leaf and considered spending the summer between eleventh and twelfth grade studying Torah, full-time, in Israel. I had one phone conversation with the infamous Baruch Lanner about it, during which he made a strange comment about my stellar PSAT scores that sounded vaguely sleazy to me. I decided to go on a less intellectual, more social, and most importantly, free, summer program in Israel, instead. I think that it was during this time when I started learning Torah, on my own, in the beit midrash of a local shul between mincha and maariv. Perhaps that was the following year, though. I brought the mishnayot of Masechet Sukkah to Israel with me, and learned some of them. By the spring of my senior year of high school, I was additionally committed to spending the summer before my year in Israel studying at a women's Torah study program in New York City. I worked full-time at the Vaad of my hometown in June and August (sorting dusty books--fun!--and doing data entry in Hebrew--great for improving my Hebrew touch-typing skills! ), and went to New York City to learn more Torah in July. Stay tuned for Part 2, hopefully later this week! 2. I remember that I had learned from Parshat Lech Lecha through the end of Breishit in 2nd and 3rd grade, I think Shmot in 4th grade. I don't remember which Chumash I learned in 5th or 6th grade. We did the first half of Breishit in 10th grade, and I think the second half in 11th or maybe 12th grade. I learned Joshua in 4th grade, Judges in 5th grade, Samuel I in 6th grade, Samuel II in 7th grade, Kings I in 8th grade, and maybe Kings II in 9th grade? After that, we learned Jeremiah, Psalms and the Five Megillot), and Isaiah. I wouldn't say that the Chumash or Nach curriculum was very well organized at the school that I attended. "It suddenly occurred to me that this was really, really fun. It was a kind of game, or logic puzzle, and when I had cracked it, it felt wonderful!" I remember having experiences like that growing up, but in math and science. i am sorry, I don't understand all the words yoi used on your post, but I am brazilian and I live "abacaxi e mamao". And i like "pao de queijo" too. Like the way you write. Interesting blog as for me. It would be great to read a bit more concerning this matter. Thank you for giving that material.